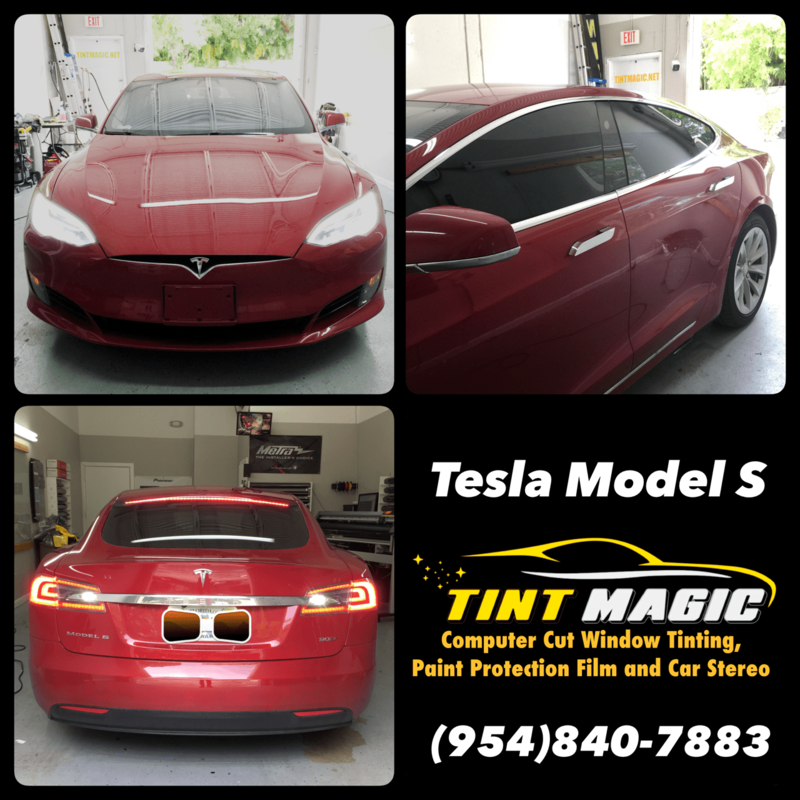 Tesla Model S at Tint Magic Window Tinting Coral Springs. We have applied Suntek CXP Nano Carbon for the best heat rejection and up to 99% UV protection. We are located at 11344 Wiles Road Coral Springs, Fl 33076. Call us for a free estimate! (954) 840-7883. The Tesla Model S has benefited from constant revisions throughout its life cycle, but its looks have stayed almost exactly the same since it was introduced in 2012. That finally changes with an update for the 2017 Model S that brings it in line with the recently revealed Model 3 sedan and theModel X crossover. Gone is the faux front grille, which is replaced by a new front fascia with slightly reshaped headlights and a sleeker, more streamlined look. Tesla also claims increased driving range for the 90D and P90D models but doesn’t cite any mechanical changes that account for the improved numbers. The 90D, with its 90-kWh battery, improves from 270 miles to 294 miles on a full charge, while the P90D sees range go from 253 miles to 270 miles. These numbers haven’t yet been published on the EPA’s website, although Tesla’s own site says they’re EPA-official. Another significant mechanical change is the newly standard 48-amp onboard charger that replaces the previous model’s 40-amp charger. Tesla says it enables quicker charging than before when connected to a 240-volt NEMA 14-50 power outlet or to a Tesla Wall Connector. We don’t have exact numbers for the new charger, but the old 40-amp system was estimated to deliver 29 miles of range per hour of charge, so expect more than 30 miles per hour for the new car. This change won’t affect the amount of time it takes to juice up with Tesla’s Supercharger network of quick chargers, and a $1500 upgrade that equips the car with a 72-amp charging system is available. A few new features also join the Model S sedan’s options list. The Model X’s HEPA air-filtration system, which is said to be significantly more effective than conventional air filters at removing pollution and allergens from the air, is now included in the $3000 Premium Upgrades package, and two new interior trim choices—Figured Ash Wood and Dark Ash Wood—are also newly available.